Can Colombia Achieve Peace Again, This Time With the ELN? 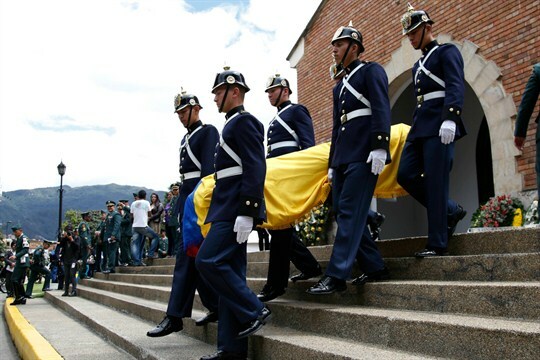 Presidential guards carry the coffin of a soldier killed in an ambush by ELN rebels, Bogota, Colombia, Oct. 29, 2015 (AP photo by Fernando Vergara). In this week’s Trend Lines podcast, WPR’s editor-in-chief, Judah Grunstein, senior editor, Frederick Deknatel, and associate editor, Omar H. Rahman, discuss what German Chancellor Angela Merkel’s precarious position in Berlin means for the European Union and the prospects for French President Emmanuel Macron’s own reform agenda. For the Report, James Bargent talks with Andrew Green about Colombia’s other peace process with the ELN guerrilla group and why it might prove even more challenging than the talks that recently ended the long war with the FARC insurgency.